Thousands of people attented a large political event during the third- and last- day of the 42nd KNE-Odigitis festival in Athens. The major speaker was the General Secretary of the CC of KKE Dimitris Koutsoumbas. Other speakers included the General Secretary of the Communist Party of India (Marxist) Sitaram Yetsury who delivered "red" revolutionary salutes on behalf of his country's communists and Nikos Abatielos, Secretary of the Central Council of KNE, who stressed that "our festival is a picture from the beautiful world for which our Party struggles". 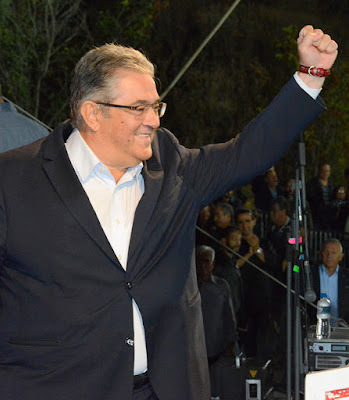 "Today, moving towards the completion, in two years, of the 100 years of our honoured and heroic Party, we can become more capable in the promotion of our political proposal, which responds to the potentiality of a better life for the working people, on the basis of today's modern needs" Secretary Koutsoumbas pointed out, adding that this can become a reality if "the productive capabilities of the country, the natural resources, the concentrated means of production become social property, with a central scientific plan, with the active participation of the workers in the organization of social production and social services". Among other visitors, the political event of the festival was attended by the ambassadors of Palestine, Cuba and Venezuela, as well as by the communist mayors (backed by KKE) of Patras, Petroupolis, Chaidari and Kesariani. Below you can see some photos from the event (Source: 902.gr).